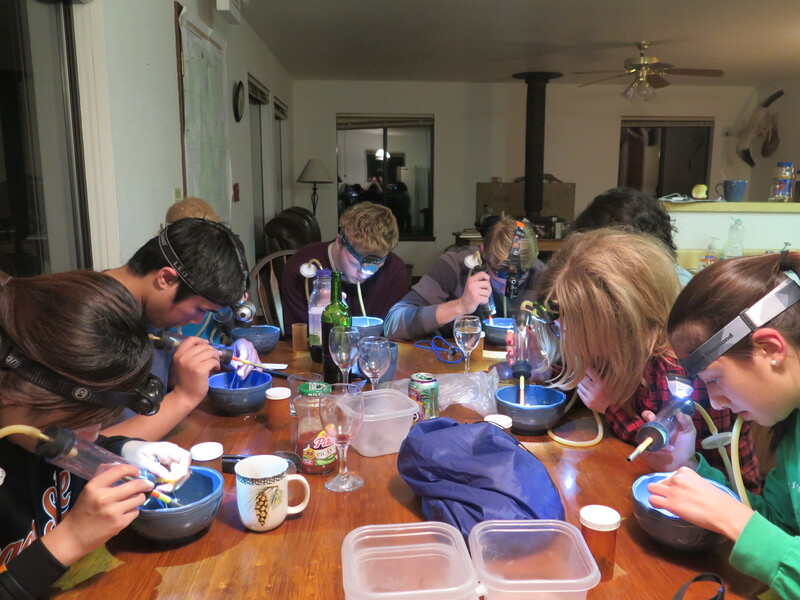 Discovering Insect Species: Klamath Marsh! 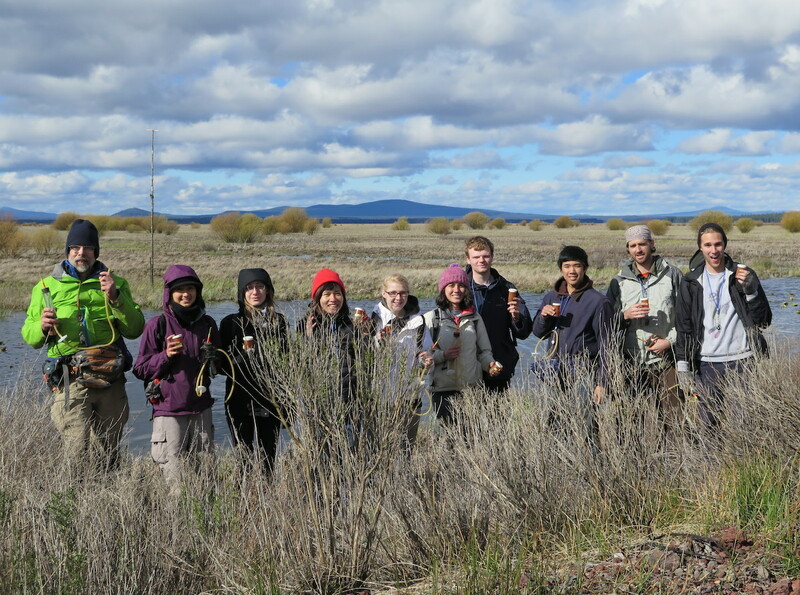 We had a great trip last weekend to the Klamath Marsh National Wildlife Refuge as part of our Discovering Insect Species course. 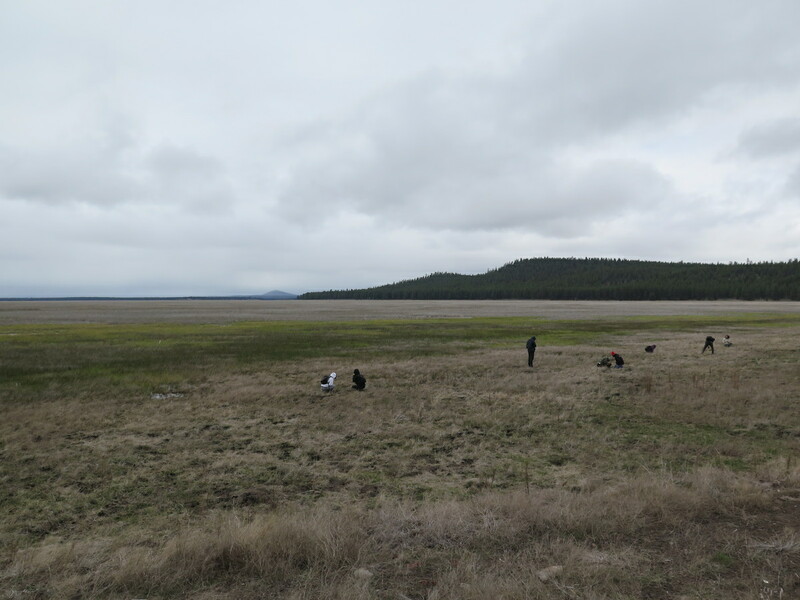 One of our main goals was to see what species of Trepanedoris lived in the large marshland complexes of southern Oregon and adjacent California. More particularly, we were hoping to get specimens of members of the Bembidion acutifrons complex, as that complex shows interesting patterns of variation which hint at multiple species. 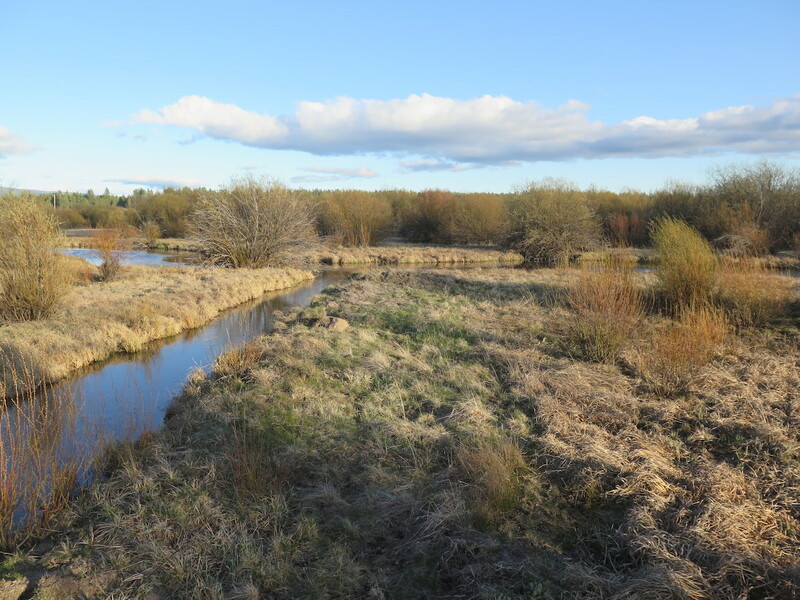 Based upon photos available online, Klamath Marsh is similar in appearance to the marshes of Alamosa NWR in Colorado, the type locality of Bembidion acutifrons. The big question in my mind was whether the B. acutifrons from Klamath Marsh (should we find them) had shiny males like the eastern populations, or dull, heavily-microsculptured males like the populations from western Oregon and western Washington. But we were also curious as to what other species of Trepanedoris might be there – with such extensive marshes, there might be surprises. 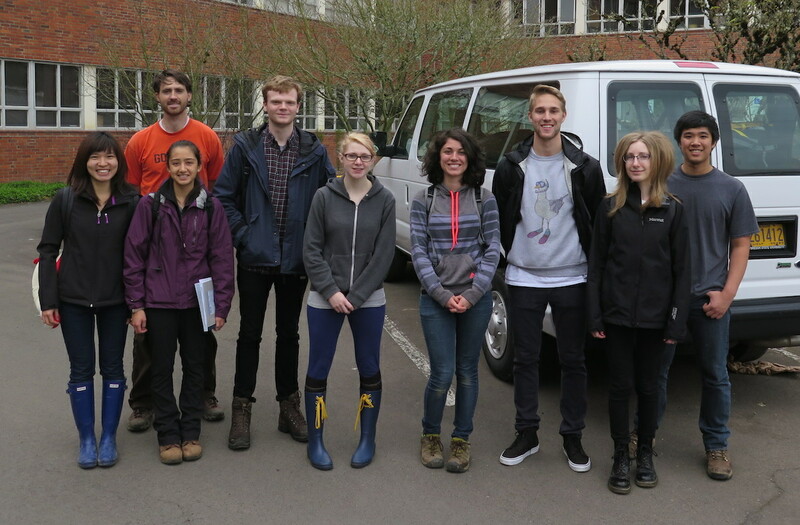 The visit to Klamath Marsh was arranged with the help of Faye Weekley, the Refuge Biologist, who provide excellent advice about possible sites. She also arranged, with the help of the Refuge Manager, Mike Johnson, to have us stay at the bunkhouse at the refuge headquarters. After an enjoyable and conversation-filled drive, we arrived at about 10 pm at Klamath Marsh. 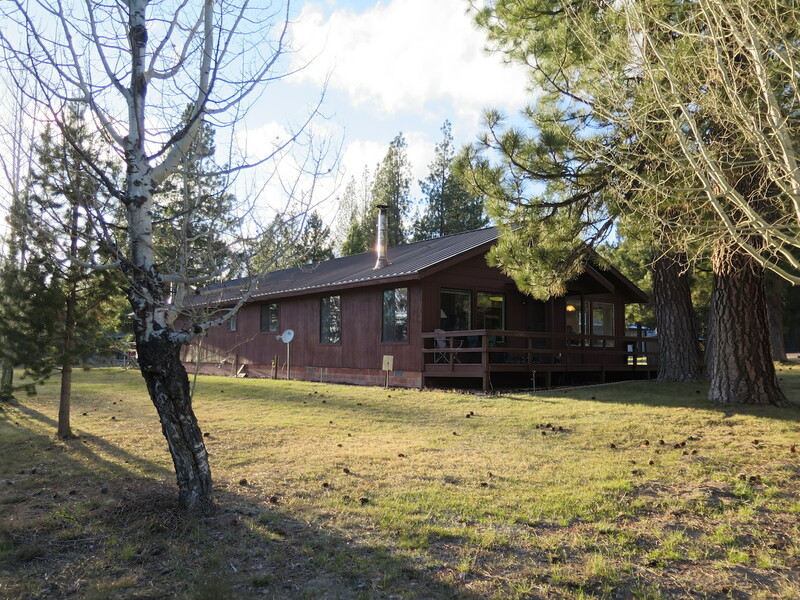 The “bunkhouse” was vastly nicer than we expected – it was luxurious for field quarters. 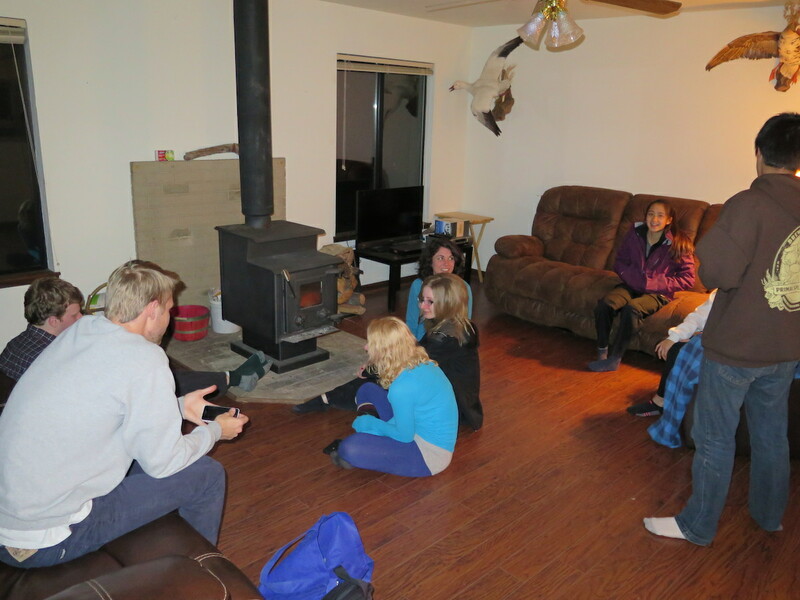 The wood stoves in the living rooms were a very nice touch. Within a few minutes, we had found our first Trepanedoris – a female Bembidion acutifrons! Then another species of Trepanedoris showed up, something that looked like a bigger, darker Bembidion fortestriatum. And a third, a male of the undescribed species that I call Bembidion “Lost Lake”! And then Shannon found a male Bembidion acutifrons, and it was a shiny one, very similar to the ones from Colorado. This was a fantastic start! Satisfied with our glimpse of good things to come, we went to bed at about 1 am. 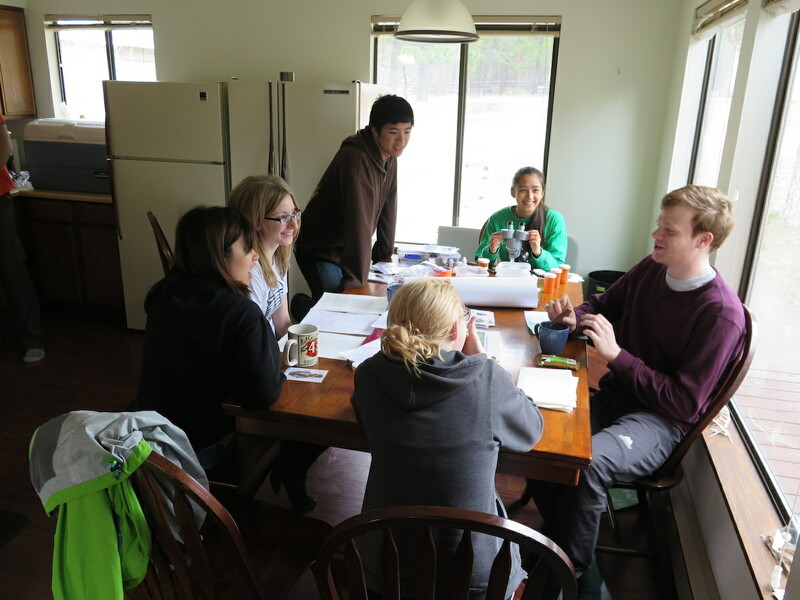 Saturday morning we examined our captures at the kitchen table. Here are the live beetles from the previous night, in a container that is floating on ice water held in a second container. One of those little beetles is the shiny Bembidion acutifrons male we were so excited about. Would we find more? After a breakfast of scrambled eggs with mushrooms, onions, and other good things, we headed out the the marshes. It was cold, with occasional rain, and only a bit of sun now and then. Our first stop yielded a few Bembidion acutifrons, as well as some Bembidion (Semicampa) and B. transparens. I was excited about both of these. The specimens of B. 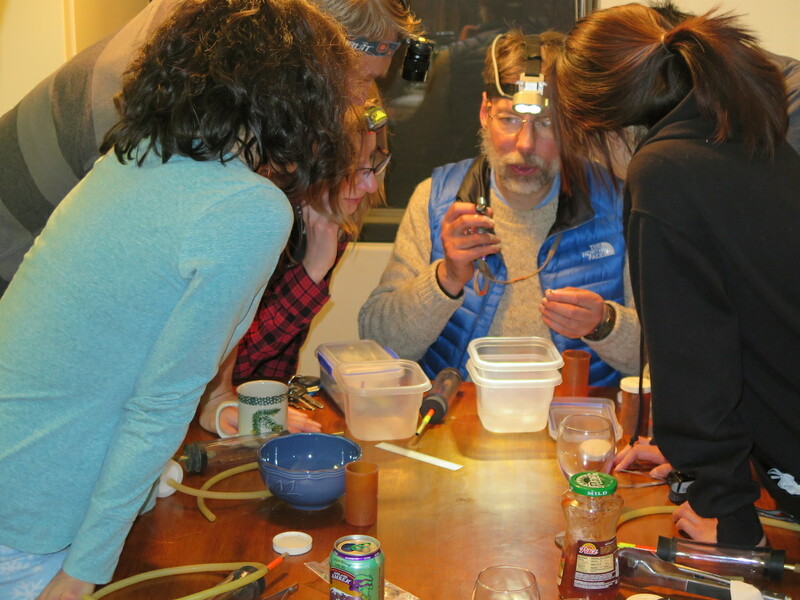 (Semicampa) were interesting as Bousquet and Webster (2006) reported that there was an undescribed species in the Klamath Falls region of Oregon, and B. transparens as this was at the extreme southwestern end of the species range and a good sample for our other studies. Our second stop was Wocus Bay, shown below. The sun poked out through bouts of rain, while we splashed and poked at dark, wet organic soil in the marsh. Members of the Bembidion (Notaphus) graphicum species group were common here, as were Bembidion acutifrons! We got a large series at last. And then we were done collecting for the day. This was an excellent set of specimens to examine in more detail under the scope and with DNA analyses, and we have high hopes that we will learn some important aspects of Trepanedoris from them. 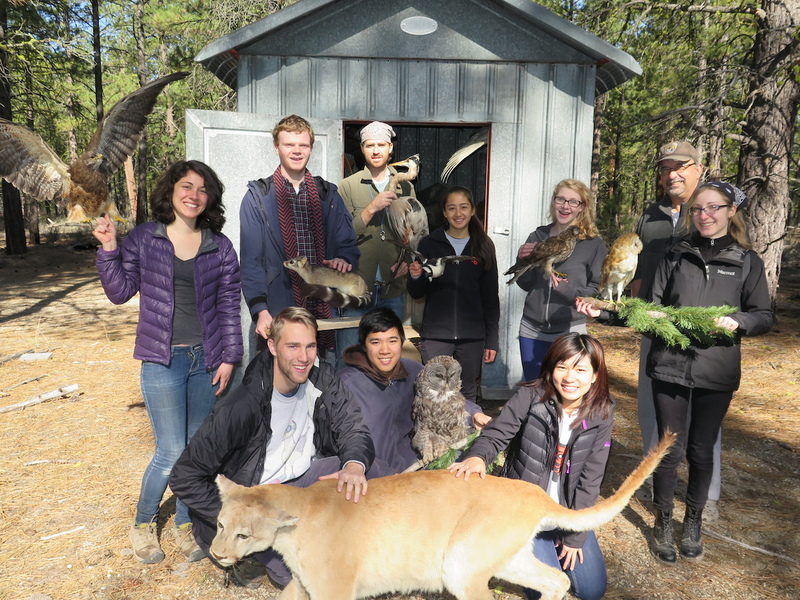 Before we headed back to Corvallis, Mike (the manager of the wildlife refuge) showed us a few cool things, including the “House of Horrors”, as he called it. Mike was a fantastic host, very welcoming, and providing all that we might wish. 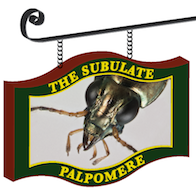 His hospitality makes it even more likely that we will be back there to see what beetles can be found in the marsh in the middle of the summer. After a rather lengthy delay on I-5 driving home, we arrived in Corvallis around 7:30 pm on Sunday, tired but very happy about our excellent adventure. 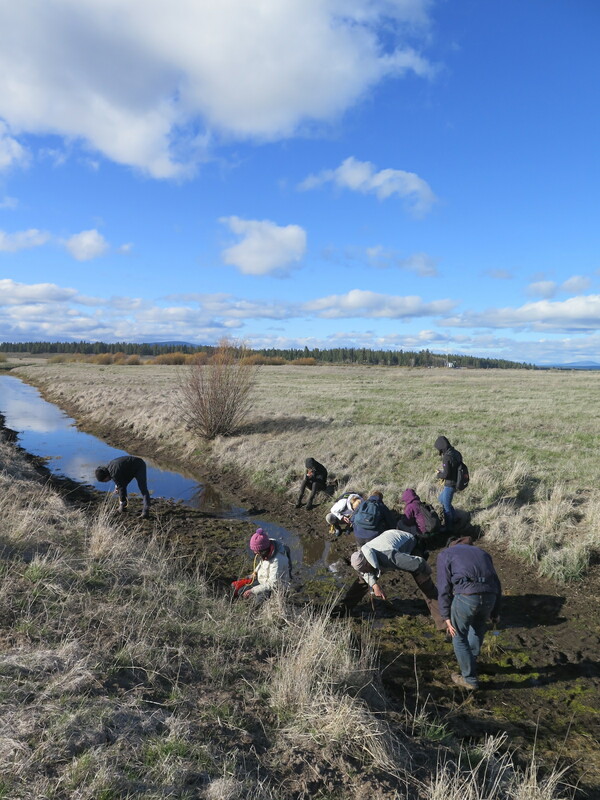 This entry was posted in Fieldwork, Public Engagement & Citizen Science, Revising Bembidiina, Z499 (Discovering Insect Species) and tagged Bembidion, Klamath Marsh, Trepanedoris. Bookmark the permalink. 4 Responses to Discovering Insect Species: Klamath Marsh!